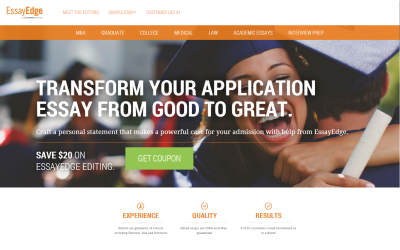 EssayEdge.com is a fresh academic editing service that is recognizable by its distinctive, visually-appealing website. However, the positive impression the customer has about the website is changed right after they start exploring its actual content and features. The claims are quite misleading, since the company advertises itself as the best editing service for all types of papers, while in reality it doesn’t offer anything more than proofreading and editing services for application essays and personal statements for surprisingly high prices. Most of the content featured at the website is focused at admission editing assistance, and it’s unclear whether or not the company provides a wider range of editing and proofreading services. Depending on the type of paper the customer needs to be edited, they can choose the corresponding category and get their content back in error-free version. There isn’t a clear pricing chart provided at EssayEdge.com, but the quotes are still transparently featured at the website. As soon as you take a look at the offered prices, it becomes clear that there are better options on the market that will deliver the same level of quality for a fraction of the price set by this company. The prices are provided in three categories: Proofreading, Standard, and Premier. The quotes are set according to the word count in the document that needs editing. Thus, the prices set for Academic Essays range from $59 to $529 (the lowest price is provided for proofreading services on papers with a word count 0-300, and the highest price is set for Premier editing service on papers with word count from 2001 to 2400). The proofreading and editing services for college, law school and medical school personal statements are priced from $69 to $529. MBA and Graduate school personal statements are edited for prices that start from $59 and go up to $529. If you intend on using the editing services at EssayEdge.com, don’t forget to visit the “coupon” section at the website and save 10% of the final price with the official coupon provided by the company. As an additional feature, the company enables its customers to choose the 24-hour rush feature for an additional charge of $59. The usual turnaround time for customers who haven’t added this feature to their orders is 48 hours when they use Proofreading and Standard services. The turnaround time for Premier services isn’t clearly specified. The lack of an active live chat feature at the website is a serious drawback, since it disables the customers from having 24/7 access to the support system. However, the company does provide contact options in the form of US phone number and a number for international customers, as well as e-mail assistance. The customers can also report their concerns anonymously via a Nelnet form. The representatives of the customer support are effective in terms of assisting the customers and providing the needed answers, but don’t act immediately upon request.